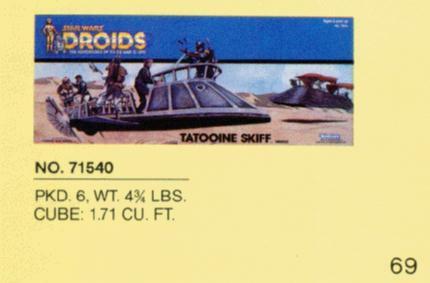 In the corner of a page in the 1985 Kenner Toy Fair catalog, there is a shot of the Tatooine Skiff in Droids packaging. Mysteriously, the skiff never appears in Power of the Force packaging. Perhaps Kenner scrapped plans to release this altogether in Droids box. There is a report of a sighting of this box at a toy show in the Cincinnati area years ago, but this version of the Tatooine Skiff box never went into production. Examining the details of this box, it is apparent that this wasn't just a small cosmetic change to the POTF Skiff box since the Droids logo and blue strip extend across the top in an odd shape. Also, the bottom portion that reads "Tatooine Skiff" is significantly different than the Power of the Force version of the box.